Sean~ We’re of the same mind. The whole thing just snaps my teeth together. I’m still incensed, 12 hours later! Lynne~ From the beginning of the MTVMA’s, it has always covered all of the movies released in a calendar year. So, the 2012 Awards should celebrate films released in 2011. Only this year, supposedly due to the shorter nomination process with the “expert panel” (those are meant to be facetious air quotes), they claim that they wanted to include more films. Ironically, the only nominated film from 2012 is THG. Hmmmmmmmmm, wonder why? I’m not saying THG shouldn’t be nominated. I haven’t seen the movie, so I can’t speak to it. But, they shouldn’t be nominated this year, end of. Suzan~ Thank you. And that’s why I love having a safe place to let it out, not that I try to hide my feelings. I am who I am. But, it is nice having somewhere to say it where all the responses won’t be negative. Tracy~ They needed one more pic or gif to adequately express our outrage, I think. It would involve the MTVMA mascot dude puckering up next to Rob’s glorious gluteus maximus! EDIT: In an interesting aside, I keep trying to comment on MTV Movies blog about the whole situation and EVERY TIME, whether logged in to my account or not, and from different computers, I am told that my comment "looks like spam" and will not be posted. Not even a varifier box where they ask me if I'm human or what have you. Just "sorry, looks like spam, no posting for you". I find that very very VERY interesting and highly irritating. Brenda - It was Eclipse. I drove my husband crazy for an hour before we got to the top. Husband: "What are you going to do when you finish the books?" Me: "I'll know what happens, now hush and let me read!" LOL I read all the series in a week but it happened to be over a weekend we were out of town. I'll have to look that up. I found a book light that I think may be better than the one I have. It's a clear acrylic page and the light comes from the "binding". I haven't had reason to use it yet, so I'm not sure how well it will work, but I'll let you know. Have to look up that Glowlight. That proceedure sounds terribly painful. But then again, the biopsy on my leg when I was nine for a lump, I watched them remove it and sew it up. The "sleeping shot" they gave me didn't work. It was cool. Your profession sounds incredibly interesting. I worked in the psychiatric section of our hospital for the first 3 years I was there. I worked on the youth floor the most and it was often heartbreaking. If that is where you're being led, then that is where you are needed. And I did a lot of research when my husband and his ex were divorcing. When he and his ex were fighting over the kids and custody...I learned a few basics that are tru no matter what state or country you live in. No one wins in a divorce, especially the kids. There's no "making it fair", there's no making it up to them. Attorney's are the only ones who benefit from custody battles and they do not have to live with the end results. I was on a forum for quite a while and there was a constant theme in the posts parents were making. "He/She thinks I won't take care of them" "I'm not letting him/her see the kids until I'm paid", "I'm their mother/father and no one is going to move in and take my place", and my favorite; "the kids don't want to go to her/his house". First, children love both their parents. Second, just because you are not being paid child support does not mean that you have the right to keep your children from seeing their father/mother. Third, you are one of their parents and even though you may do things differently, doens't mean you would ever put your child(ren) in danger. No one knows how to take care of kids to begin with...even you. And last, children are capable of loving more than one person. No one is ever going to take your place, but that doesn't mean that there isn't room in their lives for more people to love them or for them to love. I have the right to be protected from my parents' anger. I have the right to be kept out of the middle of my parents' conflict, including the right not to pick sides, carry messages, or hear complaints about the other parent. Perspective is everything during divorce. I hope you have the courage to go through with this. If you feel you're being called, trust your instincts, woman, you probably are. Lynne - I only say "Unfortunately" because it's one of those movies you really have to be in the right frame of mind for. It was crude and embarrasing in some places. I had to pause it whenever the kids came through the living room because I definitely didn't want them seeing some of that. I only watched it because I've heard so much about it and I really like a couple of the actors. But...WoW!...really? Suzan - OH! You have a stove...? I was wondering how that worked. I mean, I can make a lot of things in the microwave...but not everything. Guess I should get out of here for tonight. Watching Avatar. I'll see ya'll tomorrow! Just a fly-by because I just finished teaching my night class. Those kissing gifs over at Robsessed sent me over the edge just now. Too much to handle! I guess MTV is sending a signal the Twilight has won too many awards and that the kiss will win again anyway. I'm not as upset as the rest of you are. Do you think Rob and Kris are insulted by it? Then I guess I'd be more upset - if it is meant to be a slight to them personally rather than to the franchise. Today, rather than drive all the way home between my two classes, I went out to lunch and did a few errands and then came back to school to rest before the 6pm class. I rested in the childcare room which has a nice leather couch and a VCR. I watched part of The Devil Wears Prada lying down icing and elevating my knee. (of course there were no kids present this time of day) It was great! I definitely felt better tonight. Now I get to drive home in a thunderstorm. See you tomorrow. I hope to catch up with you all individually then. That's all for now. Be back later. Just had to share the love! I was just reading over at twifans that apparently there will be kissing between Rob and Kris during the reshoots of BD Pt1. I don't if it's true or not, but I hope it means even more romance between the two, and hopefully some vampire-type loving in the forest! Suzan - finished it? I wish! I'm having trouble convincing myself to sit down and read it at all! I'm only about a quarter of the way through. I hit one of the worst bits in it today, and I got so mad I couldn't continue. I'll have to go back to it soon, though! Tracy - thanks for posting that link! That's brilliant! I wonder if they know about the one Caryn posted on Facebook. That's great! Caryn - ah yes, of course! I keep forgetting that THG is such a recent release! Well, that really is cheating. It should have been left until next year, but I guess that they figure that interest in it will have waned by then. I have no problem with it being nominated, but you're right, it should be next year, and it shouldn't be at the exclusion of Twilight. I love this day… it’s the middle of the week, weekend is approaching fast. MTVM Awards, Caryn please think about your blood pressure! I was as shocked as you all were to see that there are so called “people with knowledge” selecting the movies. Though I don’t know if BD was a better movie than THG or HP (I mean I thought they were all good) it sure deserved to be nominated in more categories. Also I’m very worried about BD not winning anything, with THG and HP in the same categories. I think that with HP being the last one and THG still being so popular it will be a hard one. Brenda, yes I think you are right about Rob not being at the white house. I thought he was confirmed for attending the dinner. I would have loved to see him there but he choose a right day to go all ninja on us. Tracy, I think the reason they selected Rob for the scene alone is because that scene he did alone. He was the one begging a corpse to return to him… If they should win anything it should be that award. Caryn, I really loved your “I’m going to Cannes!” photo on FB!!!! Yep, stimulating the blood flow will help your body cleansing the muscles of toxins. It always works miracles for me. Suzan, I’ll send you a pm later today with a few good recipes you can make without much fuss. I would love to boycott the MTV Awards but I don’t think I’ll like the result of that much. Sorry for my long absence - I meant to get on last week, but still no time LOL. Anyway, enough of my excuses! How have you all been?!?! I've been lurking on my phone, and missed talking to you all loads! So, we got back from New York last week. Can you believe we have been married for 2 and a half weeks already?!? It's mental! We also went to see a Broadway show - we ended up seeing the Spiderman musical "Turn Off The Dark", which was VERY good! I know that it had a lot of bad press before it opened, but I think it is getting very positive reviews now. There was lot of fancy wire work over the crowd which was fun to see. We enjoyed it a lot! We also went and saw an ice hockey game. I knew nothing about the game before, we just wanted to go to a sports game as we thought it would be a cool thing to do. It was AWESOME! The game we saw was New York Rangers vs Ottowa Senators. The atmosphere was something else! We also had great seats! Unfortunately the Rangers lost LOL, but we still had a blast! We actually decided to keep watching the Stanley Cup back home, so as I am writing this, I am watching game 2 of the semi finals between Rangers & Washington Capitols. I am kinda loving it!! (and of course, I can't help but think of MoBS during this Hahahaha!). We also went on a Manhattan Movie & TV Location Tour. That was very cool!! Our tour guide was very funny & very knowledgable about a lot of movies and stuff. 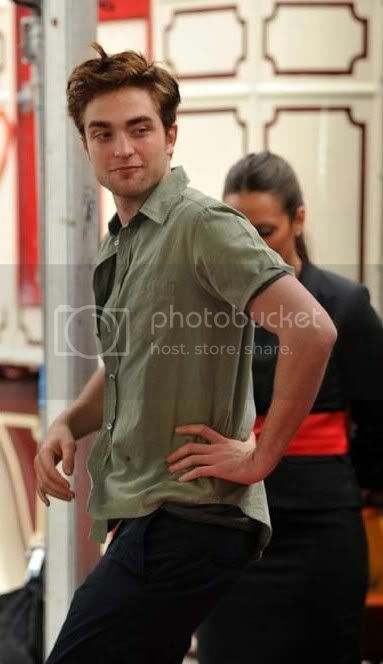 He mentioned Rob & Remember Me locations a few times! My favourite places to see was Friends locations, like the fountain where the opening credits are based on & Mocica and Rachel's apartment! (and the fact that Ross'/Big Ugly Naked Guy's place really is right across the road!!). General thoughts of New York: it is so clean! There was virtually no litter; very impressive to me considering how busy it is! Also, I thought it was very easy to navigate (and I'm kinda proud of how well we done getting there etc. I know people do it all the time, but I was a wee bit nervous LOL). And I felt very safe! I thought it was hysterical that there were signs up all over midtown saying "Don't Honk, $350 penatly" and all you could hear was people tooting their horns LOL! I also thought that, for the most part, people who served us in resturants or shops were nice & helpful (I guess they have to be to get a tip - I didn't realise tipping was up to 20%! We didn't mind, espeically if the food & service was good, but it does seem a lot - especially since in the UK tipping isn't as big a deal as in the US). And something I thought was really strange was the toilets! LOL. When they flush, they are soooo noisy! The first time, I got a big fright LOL! I've got lots more stories but I've probably spoken enough about it LOL. We had a brilliant time & wish we had had a bit longer! I defo want to go back, and want to go to more places in the US! MTVMA - I'm really shocked! I loved these awards since I was wee; I remember watching them when I was 14 or something, and that they represented films that I loved that would never be nominated for any other award show (like Cruel Intentions etc). It's sad that they have took the fan voice away. And even sadder that they think that THG can't handle competition from Twilight. I would have thought that Twilight winning most awards for the 4th year in a row would have been a good story for the press, and thus good publicity for MTV?!? I hope that people don't boycott the voting though. I want people to vote even more to show that Twilight fans are still the greatest & care the most about their movies. I still want Rob and Kristen to win Best Kiss (and part of me want them to not even bother to turn up to collect it.. but then part of me still does LOL, you know?). I'm rambling now. End point: I love Twilight; I'm sad that MTV is not letting me show the world how much! Caryn - Sorry you haven't been feeling well the past wee while. Are you stating to feel a bit better? Now that they know you have this virus, will it be able to be treated so that it doesn't come back? Ginnie - I missed it before when you popped on to tell us what's been going on with you. I just wanted to say, belatedly, that I am very sorry to hear about that. We are all here for you, and if you ever need to talk, you know where we are. Sending you majoy eHugs Girl! Marielle - Sorry that the houses you have looked at aren't what you thought they would be. If you don't like the house on Monday, are you still going to keep looking? Your holiday plans are starting to sound very exicting!! I hope you take lots of photos of the places you are visting for we can see too! LOL. Sean - Glad that you got your money & managed to buy your stuff! Are you really not gonna get BD1 though?? It's not very expensive to buy here now... how much is it in the US? Susie - How are things with your knee? That's exciting (and a bit scary!) that DaughterDear is going to South America for a year! How does she feel about it? What will she be doing? Lynne - That is very annoying that your comments weren't saved for the book you are editing! I hope you manage to get through it a second time. What is the word on your book just now? Has the other author went through yours yet? Tracy - Wow! That is very scary about the tonardo touching down at your son's baseball game!! I am glad you are all ok.
Btw, we saw some kids play baseball in NY and I thought of you! It's pretty cool; we don't really have that here. We play rounders in school, but that's about it LOL. Anyways, I am away to finish this hockey game ("Let's go Rangers!") before getting tidied up a bit around the house. I might be back later! Watching Dr Oz and I want to stab my eyes and ears. They are talking about FSoG. Bleh! I am going to go back and read some post, but can't promise to post lol! Good morning all (or at least it was when I started this post). Yep, was feeling the need for a little Jankowski love, since he was shut out of the MTVMAs, too. Not that I'm bitter or anything. Grayce~ I saw the Bill of Rights for Children of Divorce. I wish I could have shown that to … well one of my parents specifically. My experience was so completely alienating that, now, when I see colleagues of mine who actually get along with their exes and have a fairly stable co-parenting relationship at least, I can’t even fathom it. 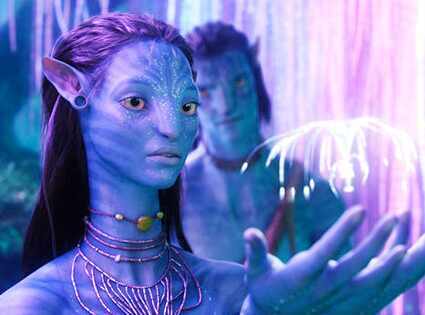 Did you enjoy Avatar? I haven’t ever seen it. Susie~ I don’t think they are insulted by it. Then again, it wasn’t a slight against them, so they shouldn’t be. Although, I could completely understand if they did see it as a little underhanded and having to deal with the disrespect toward something to which they’ve devoted themselves for a massive part of their lives in yet one more arena, and one where they thought they were relatively safe. I also wonder if they are at least a little miffed on behalf of their fans. Oh, that sounds like a fabulous way to prepare for the second part of the day. I’ve always thought that we Americans should adopt the tradition of Siesta. Lynne~ Well, at least they don’t have to interrupt their daily activities too much. They’ll just be wearing costume and make up. Marielle~ Hold on to your expectations. A house is the biggest investment you make and you should get what you think you deserve for the money your spending. I don’t think Best Kiss is in doubt, honestly. I think the only way that happens is if there is a decided movement to vote against Rob&Kris. I honestly have no idea how anyone can view the moments nominated and NOT see the passion and the connection and the intensity behind their kisses. But, I’m also slightly biased and need to own that. As for Best Movie, this is where it’s up for grabs. But, in as long as the whole of the fandom rally, I think the odds are in our favor (yes, ironic turn of phrase, I know). But, I could be wrong on that one, as well. I’m becoming more and more convinced that regular massage might help me. I’m looking into it. I’m positive you’ll enjoy your time on Mackinac. Make sure that you walk the bridge. That is an experience not to be missed! Jaclyn~ Welcome Back, Married Lady!!! It sounds like you had such a wonderful time in NYC. I’m so jealous you got to go to a Rangers game. I grew up watching the Red Wings and my dad took us to games all the time. But, there isn’t a professional team in Indiana. We do have an amateur team, but the atmosphere just isn’t the same. I had to laugh at your comment about the toilets. It’s so funny the things that catch you off guard. For me, my immediate thought is, ‘well how quiet are your toilets?’ Unfortunately, the virus that I have is pretty much a permanent edition to my body. There’s no treatment for the virus itself, only managing flareups. Jenn~ I saw a promo for that show last week. I laughed at the absurdity of it when I heard it. It might be a sad fact about me, the amount of time I spent dwelling on this last night. But, the more I thought about this, the whole issue just kept coming back around to 2013. If MTV kept their rules and processes in place, THG isn’t eligible until next year, 2013 ,and would be competing directly with BD2. They know without a shadow of a doubt that The Saga would have run away with this year’s nominations, likely overshadowing the finale of HP and would again carry the night. And now, MTV’s conflicts multiply because, in addition to having to deal with snippy fans who want to complain about The Twilight Awards Version 4.0, they also have to start preparing for the showdown that will be 2013 and their two prize fandoms going head to head. The overarching question becomes how do they suitably say goodbye to The Twilight Saga, the franchise they’ve touted and supported and banked on for (at that point) 5 years AND crown it’s heir apparant at the same time? How can they satisfy both fandoms and both franchises at once? The bottom line is, in that venue, they can’t. In essence then, they’ve killed two birds with one stone with the unfortunate side effect of chaffing the Twilight fandom a litte (but they know we’ll undoubtedly be back because of the exact kind of loyalty we demonstrate in stealing the show year after year. In letting THG take over for a year and have it’s moment in the sun, they give the larger complaining masses a mini-break from The Saga (because we know the fans will still show for Rob&Kris and likely Best Movie AND that it’s pretty bloody likely they’ll go the route of premiering a new trailer or scene to bring the Twi fandom to the show), pucker up to Lionsgate/Summitt/THG for a year, with the understanding that it allows them to send The Saga off with proper fanfare next year. I can honestly even see them reinstating the fan nomination process next year, ‘owing to the 2012 outrage over how the process was changed and how deeply they regret taking nominations out of fans hands’, or some such excuse. Then, once they’ve properly sent off The Saga, in marches the remainder of THG (although I still have no idea how they are going to make the remaining two films) to slide into the mantle of The Franchise of the Moment. In the end, I still abhor the politics behind it and I couldn’t care less whether “the masses” are tired of Twilight yet or not. But, it makes sense. And, honestly, if it’s done with a slightly higher purpose than just, “we’re freaking sick of this being the Twilight Awards and we’re bowing to pressure to change it up”, then, as much as I still hate it with a fiery passion, I can at least se a small amount of logic to it. I think they had to get THG on MTV MA this year because they have not yet even begun filming the second movie so there's no guarantee it would be on next year's list. Don't think that makes it fair, but I can see why they did it. The categories are a joke though...hardly any of them are the same. Jaclyn- It sounds like you had a wonderful trip to NY. I would love to go back to see Ground Zero. I went when I was a kid and there's just not enough about it to remember. It was in our round of road trips for summer vacation. I think that year was also Philadephia, battlegrounds...things start to run together after a while. I loved that bolding "my new hubs". That just tickles me for you! Sounds like you're extremely happy. I'll eventually have to get on FB and look through all this but I did see a few pics and you looked beautiful. Marielle- I listened to a sermon this past weekend; there's one on TV that I enjoy. He's funny and doesn't preach Hellfire and Brimstone, but he asked this question. If you knew that you had to go through 8 "NO's" to get to "YES" how would that affect your actions? When someone told you NO, or in your case found a house that was a not for you, you would just mark that off the list and say okay...only 7 more to go until I get a YES, or until we find the right house. Don't get stuck on the ones that you know aren't to your liking. Did you watch, "The Time Traveler's Wife"? I loved when they were looking for a home. He would walk through and look out the window and say, "This isnt' it". Granted he knew what he was looking for, but you usually get a good feel for a place when you walk through. If it doesn't feel right when you walk through the door the first time, it never will. Hang in there...the right place is out there! Also, you'll notice how the last scene of BD1 resembles the last scene of Avatar. As soon as I saw it I knew that's where they would end BD1. It's the perfect hanging point. I don't mean the Volturi part, but the last shot of Bella.